A website and Facebook page called “Energy in Australia” has emerged over recent months. If you ever wanted an example of “fake news” loaded with myths masquerading as facts, here it is. It’s becoming increasingly clear that the US is not the only place where the internet is being used for dressing up fake news as fact and spreading propaganda. A website and Facebook page called “Energy in Australia” has emerged over recent months and created growing interest with more than 15,000 followers on its FB page alone. The site doesn’t describe what its goal or ambition is, but a quick scroll through the posts make it immediately clear: promote coal fired energy and spread myths and misconceptions about renewable energy. If you ever wanted an example of “fake news” loaded with myths masquerading as facts, this is it is. Some of its videos are outrageous and embarrassing, even by fossil fuel lobbyist standards. What’s intriguing is this – the site says it is authorised by “Queensland Liberal MP” Matt McEachan MP, Member for Redlands and Shadow Assistant Minister to the Leader of the Opposition. It turns out that the first and major myth on these sites is the status of McEachan – he is no longer an MP, having lost his seat in last November’s election to Labor. He is a former staffer for ex-premier Campbell Newman, and describes himself elsewhere as a “consultant” to the LNP. Why does his status matter? Well, for a start he is supposedly responsible for its content, and like many others I assume when I came across the site and looked at the back ground the fact that it was authorised by a Queensland MP might have given it some weight and a sense of legitimacy. The site has already gained notoriety for posts that feed in, and off, mainstream media and Coalition talking points about energy issues. One was the surge in electricity prices in Victoria and South Australia on January 18, which the Energy in Australia website, and later energy minister Josh Frydenberg and many in the Murdoch media, blamed on renewables. They forgot to mention that the prices surged after the Loy Yang A coal generator tripped and 530MW was suddenly lost from the grid. Another post that brought the Facebook page to our attention was titled “Toxic Leak from Storage Battery – 1 Person Injured”. To add to the alarm, they used a completely unrelated image (see below) of Firefighters in full hazmat suits decontaminating themselves and a photo of a Lithium battery (that doesn’t actually contain acid). His claim was the leak “contaminated areas within the hospital”. Really? The article cited said “The spill was contained to the (generator) room”. McEachan’s statement implies that a hospital full of patients was affected when in fact that was not the case – it was an area purpose built for generators and batteries and designed to safely contain such an incident and protect the greater hospital from any potential risk. He also claimed the batteries “ruptured, spraying 80 litres of sulphuric acid,” although the MFS said in the article “they leaked the corrosive acid”. More scaremongering. And to round it out, he said “South Australians must look for safe alternatives to provide cheap and reliable energy like high efficiency, low emissions power”. His alternative for safe and low emissions power? Energy In Australia also directly perpetuates the myth of Carbon Capture and Storage (CCS) claiming a coal fired power plant using Carbon Capture and storage reduces emissions by 90% and that “around the world 800 HELE stations in operation or under construction”. Almost every energy body in Australia has dispelled the notion of CCS as impractical, in the very early stages of demonstration and even the Coal lobby admits adding CCS makes coal fired power utterly uncompetitive. I couldn’t find any evidence that 800 HELE plants are in operation – as claimed by this Energy In Australia post shared and endorsed last October by Liberal MP George Christensen – but note in their video – which was also shared on the same day (October 10, 2017) by another Liberal MP, Ken O’Dowd – the claim shifts to “planned, under construction or in operation”. And what does McEachan cite as “Reason 1” for increasing electricity bills? “Subsidies for renewable energy”. An outrageous, misleading and deceptive lie, no less. Renewable subsidies are not the major reason electricity prices are increasing as demonstrated again and again and again even by the Liberal Government’s own reviews. I am outraged and incensed that a former Member of Parliament is allowed to get away with spreading lies, misconceptions and alarmist anti-renewable propaganda, let alone that he is allowed to clearly infer that he is a legitimate MP, despite this not being the case. Liberals…telling lies…please say it ain’t so. Here is the type of rubbish he will be promoting just like his IDIOT member in parliament now. Look at the figures used yes it is from 2015 even so it is still totally incorrect. Click the picture to read the rubbish..
That’s a fair enough response, but there are 15000 (presumably quite gullible) people listening and believing to everything he says. He needs to be called out on it. You’d expect the mainstream media to do a few hard hitting pieces, pointing out in detail the lies, misinformation and general idiocy displayed on this page. Except for the Murdoch press. And Fairfax. And perhaps the ABC. Sigh. Has anyone complained to facebook? is that even possible? Here is the type of rubbish he will be promoting. information has been pulled from the full page adverts on News Media and only say that a HELE plant is needed because it will magically reduce the cost of power. These people really are spreading information that is incorrect and need to be held to account. That’s one hell of a roadtrain hauling that ‘little black wonder rock’. Lets let him run and retain the advantages of plausible deniability w.r.t. his comments and affliliation to the Liberal Party should the comments start to get wider traction at some time in the future. A subtler opponent of renewable energy is the Energy Policy Institute of Australia. Although it claims to be ‘objective’ and ‘technology-neutral’, many of its events involve the promotion of nuclear power and the denigration or misrepresentation of renewable energy as a substantial future contributor to energy generation in Australia. Can’t fraud allegations be made to pressure prosecution? …BREAKING NEWS!! 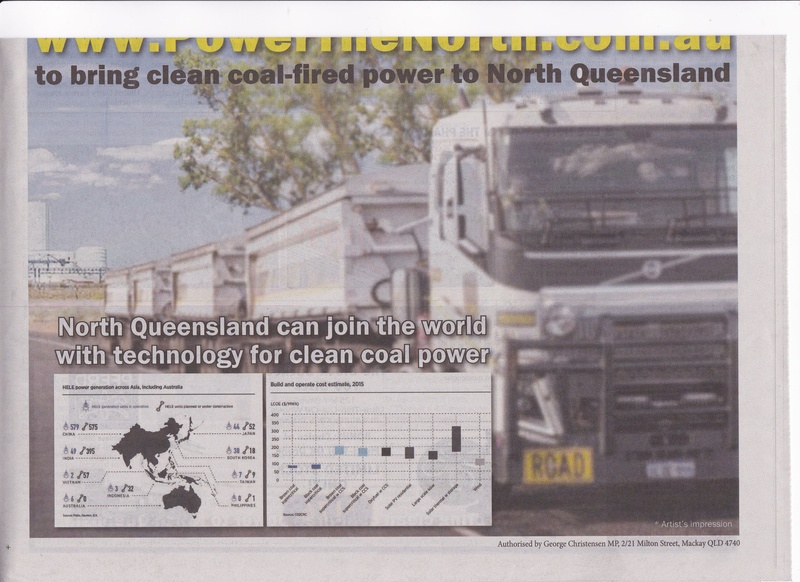 !…COAL INDUSTRY REINVENTS THE STEAM ENGINE!!! Video @ 11:00…. Yep, a coal HELE power station would be High Emissions Low Efficiency. Yep, emitting 67% of the CO2 that current coal generators emit. Compared to PV, Wind, Hydro – 0%. and at $2.2 billion per 1000 MW, any mention of Efficiency in HELE is surely some kind of joke. Painful as it is to see this type of muck being spread so liberally, straight economics will win the day. As I see it, the greater the threat to coal from renewable energy, the more hysterical will be the propaganda to oppose it. That McEachan is resorting to such fraudulent tactics is a sign that renewables are winning.